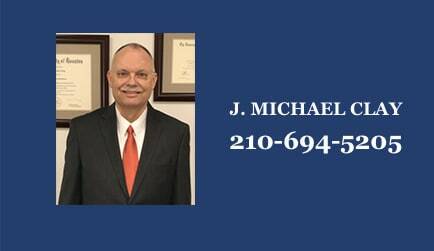 J. Michael Clay is an experienced San Antonio divorce lawyer and family law attorney handling divorce, paternity, adoption, child custody, child support, child custody modification, child custody enforcement, child support modification, and child support enforcement issues. Since 1991, he has successfully represented clients in the areas of family law, including divorce, paternity, adoption, child custody, child custody modification, child custody enforcement, child support, child support modification, child support enforcements, child visitation, child visitation modifications, and child visitation enforcement matters in Bexar County, Texas and its surrounding counties. At the Law Office of J. Michael Clay, we value the personal relationship that we develop with our clients as well as the ability to help them achieve the legal outcomes they desire. The breakdown of a marriage is almost always a difficult emotional experience. The idea of going through a long and complicated legal process can often seem overwhelming. There are many important issues, which must be resolved. Experienced San Antonio divorce lawyer J. Michael Clay will help you from the beginning through the end of the divorce process. Issues involving child custody, child support and visitation under the Texas Family Code are diverse and ever changing. These issues come up in divorce cases, original suits affecting the parent child relationship, paternity suits, child custody modification suits, and child custody enforcement suits. In order to effectively represent our clients and help them make the decisions that are right for themselves and their children, a child custody attorney must be familiar with every aspect of these highly complex areas of Texas family law. The Law Office of J. Michael Clay, focuses on Texas family law issues, including all matters pertaining to child custody. If you are in a relationship in which you or your children are the victims of family violence, we will help you obtain a protective order or a temporary restraining order . Once the court has issued a protective order or restraining order on your behalf, violation of its conditions may result in civil and criminal penalties. We will assist you in filing for a protective order or restraining order and represent you throughout the process, to ensure that the court's orders are enforced and that your interests are protected. Through our focused practice, we have honed our expertise in the areas of family law (including divorce, paternity, child custody matters - contested and uncontested, child custody modification, child custody enforcement, child support modification, child support enforcement, child visitation modification and child visitation enforcement issues). Our San Antonio divorce attorney has represented hundreds of clients and helped them find solutions to their legal concerns in these matters. We are proud of the reputation we have established representing our clients in the family law courts. The areas of family law (including divorce, paternity, child custody matters - contested and uncontested, child custody modification, child custody enforcement, child support modification, child support enforcement, and visitation issues) are complex and the laws are ever-changing. Each client is different and every situation unique. At the Law Offices of J. Michael Clay, we believe that successful advocacy requires taking the time to get to know our clients and the reasons they have come to us for legal assistance. Only then can we employ our experience and expertise to tailor specific legal solutions to fit the needs of each individual client. We understand that the proper legal solution in a given matter depends on the objectives of our client and the specific circumstances of their case. We have the resources to pursue and achieve results on behalf of our clients. San Antonio divorce lawyer J. Michael Clay is a skilled negotiator who has fashioned many out-of-court settlements to meet the needs of clients. We have also successfully represented many clients to achieve desired results through the process of litigation. We will provide you with the personalized attention that you deserve. We will use all of our skill and resources to represent you throughout the legal process to achieve the objects that you desire. The Law Office of J. Michael Clay is proud to serve the entire San Antonio Metropolitan Area, including Bexar, Kendall, Comal, Guadalupe, Wilson, Atascosa, Bandera, Medina and Kerr Counties. We offer a free initial consultation. Contact us so we can help you find the legal solutions that are right for you.